An air of such immense grief and pain blankets Gali Guleiyan, that it is almost a separate entity in the film. It swaddles Khuddoos in his dingy home as he scans a crowd of television monitors on which he watches his neighbours via surveillance cameras surreptitiously planted around the locality. It dogs the little boy Idu/Idris whose story it parallelly tells. And it wanders the labyrinthine lanes of Old Delhi where it is set. 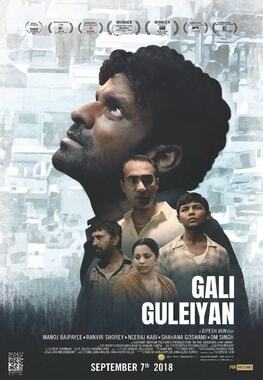 Director Dipesh Jain’s film Gali Guleiyan a.k.a. In The Shadows features Manoj Bajpayee as Khuddoos, a crumbling man in a decaying vest who spends his days and nights spying on people in the vicinity. He is so obsessed with this task, that he skips meals, barely sleeps and would probably starve to death in solitude if it weren’t for Ganeshi (Ranvir Shorey) who, unlike him, has a head on his shoulders and a life. Ganeshi keeps checking in on his messed-up friend, bringing food and jobs for his survival. Khuddoos’ life trundles along in this state of miserable inertia until he hears the sounds of what seems like a child being abused in a house with which he shares a wall. A desperate urgency takes over his entire existence as he tries to figure out who the kid is in the rabbit warren that is their locality, as if his remaining shreds of sanity depend on whether he can save the boy. In that same Old Delhi, Idu (Om Singh) and his best bud Ginny (Arbaaz Khan) skip around merrily exploring the area, peeking into the homes of unsuspecting residents and watching films in a video store, their innocent happiness in each other’s company a marked contrast to Idu’s challenging family situation. Home for him is a loving mother (Shahana Goswami) who tries her best to protect him from the wrath of his autocratic, combustible father (Neeraj Kabi). Not that action comes easy. If and when the Khuddooses of the world do set out to find that wailing child on the other side of the wall, nothing better emphasises the enormousness of the challenge before them than Miedendorp’s striking shots of that cluttered neighbourhood with which Jain closes the film. Another star of this enterprise is editor Chris Witt, whose unerring back and forth between Khuddoos and Idu ensures the smoothness of this film’s narrative. Jain (who is also Gali Guleiyan’s writer) is a master of detail and of understatement. He leaves it to viewers to notice or not, for instance, that the children saunter across a bustling main road at the edge of which Khuddoos hesitates with trepidation. Or that most of this film’s primary characters are practitioners of Islam, a fact that we are made aware of without any particular emphasis on their Muslimness, unlike Hindi films of the pre-2000 era in which a Muslim presence necessarily meant nawabi ada, shayari and/or golden hearts. In this aspect, Gali Guleiyan is part of the evolution of Hindi cinema in the matter of representation in the past decade during which Muslims (unlike members of India’s other minority communities) have been increasingly featured in films as regular people – good, bad and ugly – instead of specifically to emphasise any aspect of their religious/cultural/political identity or to unwittingly other them through (I guess well-intentioned) deification. Gali Guleiyan is swathed in the shadows referenced in its title, giving it an air of mystery and simmering unrest. It would be a disservice to this film – and a very literal interpretation of it – to view it as a conventional thriller though. What Khuddoos discovers towards the end is allowed to gradually dawn on the viewer for a while before the closing scenes, so that the real mystery becomes not whether he will ever find and save the suffering child in the adjacent flat, but whether he will ever save himself from the confines of his shattered mind. Manoj Bajpayee as Khuddoos brings an almost fiendish intensity to his role, which is made all the more challenging by the seemingly unvarying nature of the man’s moods and demeanour. Through that surface sameness though, he manages to let on that he is forever on the verge of boiling over, a suspicion that is confirmed in that single scene in which he metamorphoses into a snarling beast in a local eatery. Shahana Goswami has, since her debut over a decade back, been sadly under-utilised by the more commercially inclined arms of Bollywood, as Bajpayee was for almost a decade and a half after Satya (1998) and Shool (1999). That Bajpayee is now enjoying a wonderful second innings as the protagonist in an interesting mix of conventional and offbeat projects should make us optimistic for young Ms Goswami whose phenomenal talent indie filmmakers ought to reward with more lead parts and who blinkered mainstream filmmakers will hopefully tap for larger roles some day soon. She lends tenderness and warmth to her role as Idu’s mother, switching with seeming effortlessness between her affection for her children and her quiet tension around her husband. Gali Guleiyan brings us one of the best ensemble casts of the year from Hindi filmdom, though Om Singh deserves to be singled out for his performance as Idu, capturing with equal assurance the child’s playfulness and his animosity towards his father. The words “inspired by a true story” appear on screen at the start of Gali Guleiyan. We all know that what happens to the people in this story happens routinely in real life, yet to have it spelt out clearly, to be reminded so emphatically that Khuddoos and Idu are not fiction, adds to its poignance. It has been several days since I watched this film, and even now an acute sadness grips me each time I think about it. The beauty of Gali Guleiyan lies in the fact that I never ever want that feeling to go away.